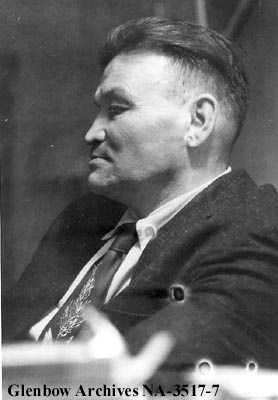 Jim Brady (1908-1967 - on a prospecting trip) was one of the founders of the Metis Association of Alberta, likely joining the movement in March 1932 (source Dobbin, 1981:60). Other founders included Malcolm Norris, Joseph Dion (president from 1932 to 1960 and followed by Adrian Hope who was president from 1960 to 1967), Peter Tomkins (reported to have joined in 1933 and elected to the executive in 1934 (source Murray Dobbin. The One-and-a-Half Men. Vancouver: New Star Books Ltd. 1981:63), and Felix Callihoo (sometimes spelled Felice Calihoo). The Association was formed at a province-wide meeting on December 28, 1932 under the name L'Association des Métis d'Alberta et des Territoires de Nord-Ouest; other names used up to that point were l'Association des Métis d'Alberta and possibly, mentioned in Alberta Archives, the Metis Brotherhood of Alberta. In 1941 according to the Glenbow Archives he was the Supervisor of the Wolf Lake Metis Colony (no longer exists). In 1943 he enlisted in the army. After WWII he moved to La Ronge, Saskatchewan, worked for the government, helped establish co-operatives, and prospected. Brady helped found the Metis Association of La Ronge and the Metis Association of Saskatchewan. While he was living there he received requests from people in Alberta to return there to continue to help with the Metis Association of Alberta. In fact, Brady's and his family's activities were broad reaching and indicative of the strength of Metis activism revolving around Batoche, Saskatchewan, Northern Alberta including St. Paul and the development of the Metis Settlements. Brady's grandfather was a friend to Louis Riel (source: Brady's letter to PC Tomkins April 14, 1934 page 3 in Glenbow archives). Brady's father, James P. Brady Sr. was the Dominion land agent at St. Paul des Metis, Alberta. (Dobbin) According to the Glendow archives network website James Brady Sr. was "an Irish immigrant, and Philomena Garneau, a Metis from Strathcona."